"The Fatal Heir" being shot at Ted and Kathy's The Old Townhouse Restaurant. Michael Brueggemeyer is sleeping on a couch in a small cottage he and several colleagues rented a few miles outside the town of Cannes, France, and he couldn’t be more delighted. 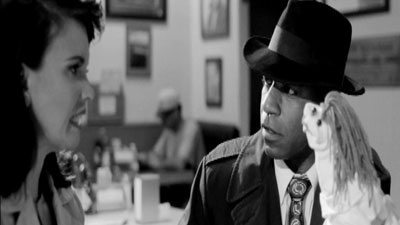 The San Diego film director is attending the Cannes Film Festival in hopes of raising money to produce a feature-length version of their 10-minute film noir, “The Fatal Heir,” starring a Philip Marlow-style detective, Johnny Love. It’s being screened in Cannes today by the international filmmakers’ 48-Hour Project. 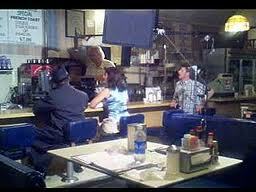 Detective Johnny Love speaking to another character inside the Old Townhouse Restaurant. The film was born early last year when Brueggemeyer pulled out of a hat the names of a film genre, a prop (chair), a character, and a line of dialogue (“I’m trying my best.”) He and his team had 48 hours to write, direct, produce and edit a short film for the local 48-Hour Project competition. After winning in San Diego, it was selected by the Filmapalooza contest in Miami this spring to be among 17 screened by the 48-Hour Project in Cannes. OB is full of ironies. The pub that showed the premier remains nameless as they refused to take out an ad with us – after telling us they were very interested – all because of pressure from The Black due to our stance on the bum sticker. If someone wanted to start a local ruckus by sabotaging anothers business dealings, then it would seem to me it would not be smart to call out a business that specializes in the written word.Why would the black (until they repent, Iwill refer to them in the lower case. A status that is reserved for the dummies of OB) make such a lame move. Is Jack still running that dump?